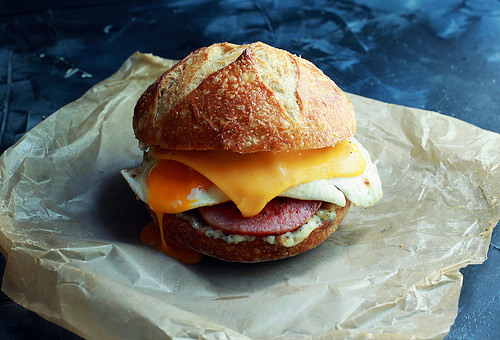 Taylor ham, egg, and cheese is such a classic combination. For me, put it on an everything bagel with a little salt, pepper, and ketchup for a good morning. I have been eating them for as long as I can remember. On the weekends, I would cross my fingers that my dad would stop at the bagel store. As I grew into my high school and college years, weekend stops at the bagel shop became a routine. Taylor ham originated in New Jersey which is why if it is on a burger or sandwich it usually has “Jersey” in its name. It is a pork product that is mixed with spices, salt, and a sugar cure before being packaged. However you choose to enjoy this sandwich, make sure to stack it high and open wide! I took this iconic sandwich and elevated it by adding everything mayo and sourdough bread. Of course, I didn’t forget about the taylor ham and creamy, melty Land O Lakes® Deli American! Heat a sauté pan on medium heat. Score the edges of the taylor ham slices. This helps them stay flat while cooking in the pan. Add the taylor ham to the pan about 3 minutes on each side. If you like the taylor ham crispier then cook it longer. Remove the taylor ham and set aside. Crack the eggs into the pan. Let them cook until the edges of the eggs are brown and the yolk has set. About 3 minutes. Then place a slice of Land O Lakes® Deli American on top of the eggs. Cook for one minute longer. After removing the egg from the pan place the sourdough bread in the pan to toast slightly if desired. Combine seasonings in a small bowl and crush with the back of the spoon to break them down a bit. Then add the mayonnaise to the bowl and mix to combine. On a piece of sourdough bread spread on a tablespoon of Everything Mayonnaise. Then add your egg with Deli American. Top with taylor ham. Spread another tablespoon of everything mayonnaise on the second piece of sourdough bread, top, and enjoy! Note: If you enjoy a runny yolk, be sure to buy pasteurized eggs and as always, remember that undercooking food, such as egg yolks, can cause foodborne illness. Note: This will make more than you need for this recipe, but trust me, you’ll want to keep this in your fridge. Stored in an airtight container, it will stay good up to 2 weeks.